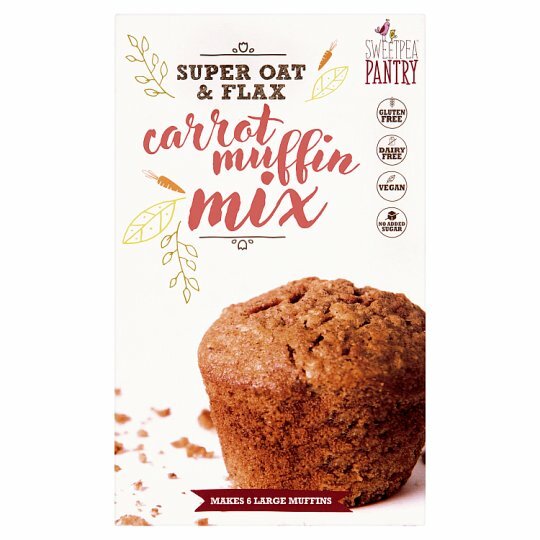 Our gluten-free Carrot Muffin Mix is packed with mighty flaxseed, crowd-pleasing carrot and powerhouse oats. All of our mixes are full of wholesome ingredients and are easy to prepare. That's how Sweetpea Pantry helps you get the goodness in. Have you tried our other Sweetpea Ready Mixes? We make great tasting, easy and wholesome versions of your favourites: pizza dough, pancakes, brownies, energy balls and flapjack. We are Sweetpea Pantry and we are passionate about delicious real ingredients and free-from choices. We help you to get nutritious goodness into your meals and snacks, quickly and easily. Store in a cool dry place., For best before date see base of pack. 1. Put your Sweetpea Muffin Mix into a bowl and stir through the boiling water, oil and honey/syrup. Whisk your egg and stir into the mix. 2. 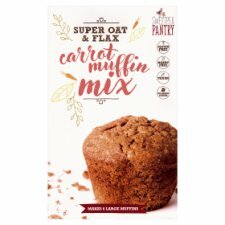 Spoon mixture equally into 6 large muffin or cupcake papers in your muffin tin (can also be made in a loaf tin) and bake in pre-heated 180°C oven for 20-25 minutes until browned and a skewer inserted in the centre comes out clean. Add a handful of chopped nuts - pecans or walnuts to the mixture before baking.